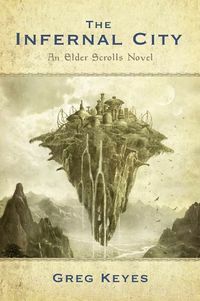 The Infernal City is the first of two novels written by Greg Keyes that follow the story of The Elder Scrolls between the events of Oblivion and Skyrim. The book was published by Del Rey Books, part of the Random House Publishing Group, on November 24, 2009. The floating city of Umbriel is making its way across Tamriel and destroying the lands it passes over, killing the people and raising the dead to power the city. Annaïg Hoïnart, a 17-year-old Breton girl, and her Argonian friend, Mere-Glim, accidentally fly onto Umbriel and are captured by its inhabitants; Sul, an aged Dunmer, joins Prince Attrebus Mede, the 22-year-old son of Emperor Titus Mede, in search of a way to stop the city; and Colin, an Inspector for the Penitus Oculatus, searches for the prince when he goes missing during his quest. Their adventures take them along the first steps in attempting to stop the most recent threat to Tamriel. An excerpt from the book can be found here.